The eastern lowland gorilla—also known as Grauer’s gorilla—is the largest of the four gorilla subspecies. It is distinguished from other gorillas by its stocky body, large hands and short muzzle. Despite its size, eastern lowland gorillas subsist mainly on fruit and other plants. 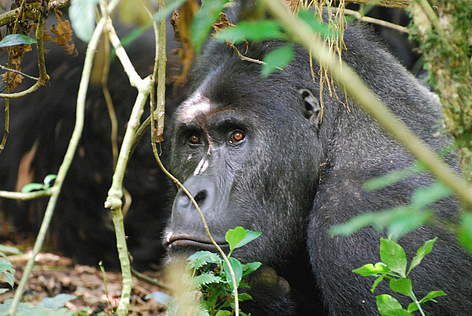 Eastern lowland gorillas are endemic to the tropical rainforests of eastern Democratic Republic of Congo (DRC). Due to intense human activity over the past 50 years, their range has decreased from an estimated 13,000 square kilometers to about 7,400 square kilometers today. This subspecies may now occupy only 13% of its historical range. There were nearly 17,000 eastern lowland gorillas in the mid-1990s but scientists estimate that the population has declined by more than 50% since then. A census could not be carried out for many years because of violence in the region. Years of civil unrest in the country have also taken a serious toll on the gorillas.Throughout the protracted conflicts, gorillas have been vulnerable to poaching. Even Kahuzi-Biega National Park, which is home to the largest population of protected eastern lowland gorillas, could not offer them a safe haven: rebels and poachers invaded the park and people set up illegal mines. Habitat loss and fragmentation: As humans have moved from high-density regions in the East of the country into gorilla territory, they have destroyed and fragmented much of the forest habitat to make room for farming and livestock. Mining: Illegal mining for tin, gold, diamond and, especially, coltan—an alloy used in cell phones—is widespread throughout the habitat of eastern lowland gorillas. Civil unrest: Years of political instability and conflict have left the Congolese network of national parks in a state of neglect. Humans have been able to encroach upon protected areas to hunt gorillas and to set up illegal mines. In addition, military activity and the presence of heavy weaponry have contributed to unrest in the region, making conservation efforts difficult.